YEARS of hard work for some came down to a couple of hours of celebration, and for the top 12 selected in the AFL Women’s Draft, they not only realised their dream, but also walked straight into media street and the realisation that their lives were about to change. Here are the top 12 from today’s draft. Geelong selected star outside midfielder, Nina Morrison with its first pick. 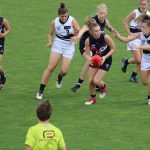 Morrison was extremely impressive in the TAC Cup Girls competition and Victorian Football League (VFL) Women’s competition with her blistering outside run and chase-down tackling. She won the TAC Cup Girls Best and Fairest (along with Madison Prespakis), was named the Most Valuable Player (MVP) for Vic Country at the AFL Women’s Under 18 Championships and was named the MVP of the tournament (also alongside Prespakis). Morrison was joined by Greater Western Victoria (GWV) Rebels midfielder/ forward, Sophie Van De Huevel at Geelong in 2019. The talented cricketer/ footballer’s strength in the contest was outstanding and her goal sense was just as good, showcasing her impressive versatility. 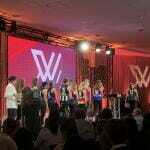 Van De Huevel represented Vic Country this year and was named in the AFL Women’s Under 18 All Australian team. The first Victorian metropolitan player to be selected was Madison Prespakis, who went to Carlton at pick three. Prespakis dominated in the midfield, and also rolled up forward for the Calder Cannons this season, being named best-on-ground in all but one game she played in. She has had a stellar year, being named the TAC Cup Girls Best and Fairest (with Nina Morrison), the MVP for Vic Metro in the AFL Women’s Championships, the overall MVP for the tournament (with Morrison) and the Calder Cannons Best and Fairest. Fremantle secured midfielder, Jasmin Stewart with pick four. Stewart has a great left-foot kick and her agility is sublime. 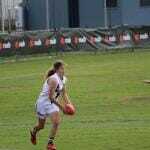 She was invited to the AFL Women’s Combine this year and tested well. With pick five, Collingwood gave defender/midfielder, Jordyn Allen a black and white jumper. Allen marks the football extremely well and has a booming kick, impressing for the Dandenong Stingrays this season. She captained the side in the TAC Cup Girls competition and also got a spot in the AFL Women’s Under 18 All Australian side on the half-back flank. At pick six, Melbourne took Gippsland midfielder, Tyla Hanks. Hanks was a star for the Power this season, excelling in the midfield and proving her versatility by making an impact in the forward line at times. She was named in the AFL Women’s Under 18 All Australian side as a follower this year, and led the Gippsland Power beautifully as a co-captain. With their third pick in the top 12, the Cats welcomed Rebecca Webster to their side. The talented midfielder/ defender has impressed for the Bushrangers throughout her tenure at the club with her strength and long kick. Webster is a member of the AFL Women’s Under 18 Academy and represented Vic Country at the AFL Women’s Under 18 Championships this year. The first South Australian to be selected was speedy midfielder, Nikki Gore. Gore combines strength, speed and agility with ease, and has done so in both South Australian and NT Thunder colours. 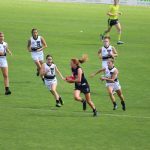 She is a member of the AFL Women’s Academy and has a high work ethic that will undoubtedly be invaluable for the Crows. At pick 10, the Bulldogs have selected Eleanor Brown. 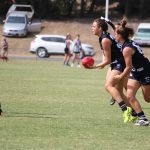 Brown dominated in the midfield for Sandringham in the TAC Cup Girls season and made a name for herself at half-back for Vic Metro. 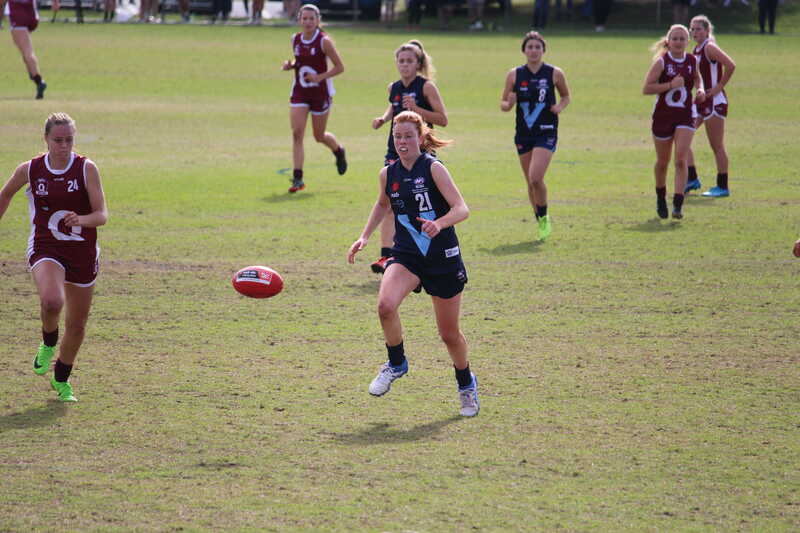 She was one of the top performers at the AFL Women’s Under 18 Championships. Collingwood’s second pick in the top 12 was Katie Lynch. Lynch had limited game time for the Chargers this season but whenever she did play, her impact was profound in the midfield. She represented Vic Country in the AFL Women’s Under 18 Championships this year. 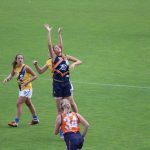 The last pick in the top 12 was secured by the Greater Western Sydney (GWS) Giants, who picked up Thurgoona’s Alyce Parker. Parker is a powerful midfielder who can roll up forward and make a serious impact. She was named in the AFL Women’s Under 18 All Australian side, was named MVP for both the Central Allies and NSW in the AFL Women’s Under 18 Championships and was named best-on-ground in Thurgoona’s premiership side this year.